A two-time Olympic gold medal winner, Lindsay Tarpley’s playing days ended far sooner than hoped, taking the former U.S. Women’s National Team forward’s focus down new avenues, although as an exciting new venture proves, she has never flown far from the game that always was a dream to her. The University of North Carolina and women’s soccer are bonded together; from the masses of National Championships, to the six former Tar Heels currently on the U.S. roster at the World Cup, and so much more beside. Someone who knows all about blazing a trail for UNC in the college game and transferring it to the big stage is Lindsay Tarpley, the former Tar Heels captain who had two Olympic gold medals to her name before even reaching her 25th birthday. A member of the U.S. team that took bronze at the 2007 FIFA World Cup, the versatile midfielder/attacker won 125 caps for her country, scoring 32 times along the way and turning out for the likes of Chicago Red Stars and Boston Breakers in Women’s Professional Soccer (WPS). Tearing an anterior cruciate ligament in her right knee in 2009, the Madison, Wisconsin-born player suffered the same fate in a World Cup warm-up match for the States against Japan in Columbus in May 2011. The injury inevitably put Lindsay out of the tournament that year, and despite her best efforts and even making a professional roster again (with Chicago) for the 2013 National Women’s Soccer League (NWSL) season, a return to the playing environment she had illuminated so many times proved not to be. The script changed for the 2002 FIFA Under-19 World Championship goal-winning hero but the mother of two young children remains closely connected to soccer. Still just 31, Lindsay is one of the notable figures currently leading the launch of Sweat Cosmetics alongside the likes of former teammates Taryn Hemmings, Leslie Osborne and Courtney Jones. Even post-playing, the two-time National Champion at UNC is bringing something to the game and to women leading an active lifestyle, but safely stored in the memory banks are the times when it was her out there on the field, fighting for her team and finding the moments to smile. Last February, Lindsay’s former Boston teammate and England right-back Alex Scott dug deep into her musical side on this site, as is the way with each interview on here, recalling the party atmosphere in the locker room that the Breakers players enjoyed back in WPS. Lindsay joined Boston for the 2010 season and with 1999 World Cup-winning U.S. coach Tony DiCicco at the helm the Breakers secured a regular-season placing of 2nd before narrowly missing out on the Championship game. In a league brimming with star quality, the Breakers had their share, boasting names like England icon Kelly Smith, the great Kristine Lilly in her career’s final year, as well as the emerging talent like midfielder Jordan Angeli. Lindsay, who had her number 25 jersey retired at UNC in 2006, was undoubtedly in similarly esteemed company and it still only takes a second to close her eyes and be back there. Growing up in Kalamazoo, Michigan, Lindsay was a star athlete at Portage Central High and scored, set up two for her teammates, and netted the winning penalty to beat Bishop Foley Catholic High School and win the state championship as a sophomore. A Kalamazoo Quest and New Jersey Wildcats player while in high school, she was a Parade All-American in 2001 and 2002, as well as being named the 2002 U.S. Soccer Chevrolet Young Female Player of the Year, amongst other accolades. Lindsay’s leadership and her incisive attacking play caught the eye in high school soccer but she also played varsity basketball throughout these four years and was her school’s MVP in each. A point guard, she had the single-game, season and career records at her school for steals and assists. Way before the magnificent successes she earned at the Olympic Games of Athens in 2004 and Beijing in 2008 she could only try to envisage such glory on the biggest platform. She would become a pretty notable dancer in the locker room of course but maybe with a little break of good fortune here and there she might have joined this singer she mentions on a whole different stage! 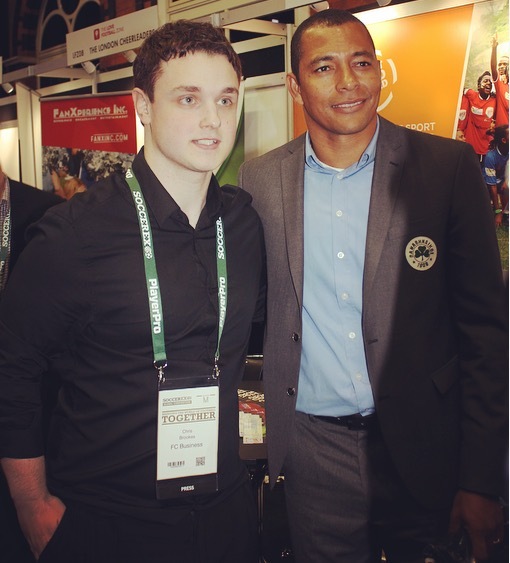 A hugely impressive scorer for the National Team at Under-19 and Under-21 level, Lindsay captained the U.S. in Canada for the FIFA Under-19 World Championship in 2002. She made the tournament’s All-Star Team with Heather O’Reilly after her extra-time winner against the hosts in front of 47,784 in the final at Edmonton’s Commonwealth Stadium. It was a history-making moment as the Americans secured their very first youth title and Lindsay had future pros on her side like midfielder Leslie Osborne and a 16-year-old Ashlyn Harris in goal. That goal and getting to lift the trophy as captain of her nation was undoubtedly the most incredible achievement of Lindsay’s young career at that point and 2002 was also the year she began at UNC. As the retired jersey alluded to earlier would suggest, she was to emphatically leave her mark in her three years as a Tar Heel, winning accolades including the ACC Rookie of the Year, the Soccer America College Women’s Freshman of the Year, and captaining the team in her junior and senior year. As a sophomore in 2003 she led the nation in points (23 goals and 27 assists), winning the National Championship and Soccer America’s College Women’s Player of the Year as the Tar Heels went 27-0-0. She finished up her collegiate career with 59 goals and 59 assists, despite having her junior and senior years severely hampered by time spent sidelined with a broken leg. 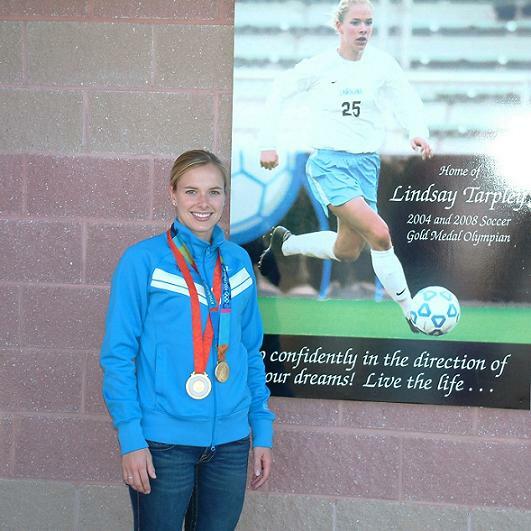 Entering her junior year at UNC, Lindsay had a major contribution to make as the USWNT took gold in the 2004 Olympics. In the final versus Brazil, she struck a superb opening goal from outside the box into the corner with her right foot in a game the U.S. would win 2-1 after Abby Wambach clinched it in extra-time. Standing on the podium for the first time, Lindsay had won gold in Athens playing for another noteworthy Tar Heel at that tournament, coach April Heinrichs. After her days at North Carolina down in the south, maybe it makes sense for there to be a little country flavour in Lindsay’s music choices, shown through the live show she picks out here. “My favourite concert was Rascal Flatts. To be honest, whatever someone downloads to my iPod is what I listen to! Before she had the chance to become a full-time professional in WPS, Lindsay had another gold medal to her name, although the odds seemed stacked against the USWNT as they lost Abby Wambach to injury just before the 2008 Games in Beijing. Losing their opening game to Norway in Pia Sundhage’s first major tournament as coach, the U.S. recovered to go all the way. Lindsay hit the target in the 4-0 group win over New Zealand and started every game, culminating in the 1-0 extra-time win over what was a very strong Brazil side back then. It was sweet revenge after the team’s loss to the same opponents at the semi-final stage of the 2007 World Cup (also in China), where the U.S. finished third, and it was midfielder Carli Lloyd who came up with the winner. She would become a teammate of Lindsay’s at the Chicago Red Stars in the inaugural campaign of WPS in 2009 as professional women’s soccer finally resumed play in the States, some six years after the Women’s United Soccer Association (WUSA) had folded. Lindsay got to wear the armband for Chicago and it was the undoubtedly gifted, if enigmatic, Brazilian forward Cristiane who brought the samba vibes to the locker-room sound system on game day. It may be true that Lindsay was much more of a mover than the one to choose the tracks but she was no stranger to using her vocals for more than just giving direction on the field as captain. Coming up with four goals in her debut season as the Red Stars finished 6th, Lindsay made the move to Saint Louis Athletica in January 2010, with National Team goalkeeper Jill Loyden moving in the opposite direction. Blighted by a funding crisis for the team’s ownership, the St. Louis franchise folded a few months later, leaving players including U.S. keeper Hope Solo, Japan midfielder Aya Miyama, and English duo Anita Asante and Eniola Aluko without a club. As one of those free agents, Lindsay signed with the Boston Breakers, linking up with a National Team midfielder who was still to turn 23 – Lauren Cheney. The current FC Kansas City star will surely have a major part to play in the upcoming World Cup final against Japan and as so many have mentioned on here in recent years, she is usually a good bet for the team playlist. It is far from a given, but sometimes friendships last in soccer, and when put on the spot and asked which teammate she would choose to record a song cover with, it was the U.S. number 12 who won through for Lindsay. In the third and final season of WPS (2011), Lindsay was with magicJack, who had been rebranded from their previous guise as Washington Freedom and relocated to Boca Raton, Florida. The roster was filled with premier talent, from the likes of Becky Sauerbrunn and Christie Rampone at the back, to attacking threats like Abby Wambach, Australian live wire Lisa De Vanna and U.S. forward Christen Press in her rookie season, to name just a few. Of course this was the year that Lindsay tore her ACL for a second time, prompting Heather O’Reilly to say that the U.S. would play for her in the World Cup. After WPS officially folded in 2012, the NWSL became the third women’s pro soccer league in the States, beginning play in April 2013, with Lindsay selected by Chicago in the Supplemental Draft. Although no timeframe was given it seemed there was still a chance that the player who became the third-youngest to reach 100 caps for the USWNT in July 2008 would return. One of the operations carried out on Lindsay’s knee was a microfracture procedure to help new cartilage grow but despite her efforts and wishes she describes how she came to realise that the playing chapter of her story had come to an end. “Unfortunately, I have had five surgeries on my knee since my injury. I have tried to overcome this injury and get back on the field and continue to live my dream. Much has changed since fans last saw ‘Tarp’ stepping around opponents. Together with her husband, the former UCLA Bruins head women’s soccer coach, now leading the U.S. Under-17 Women’s National Team, B.J. Snow, she has two young children. Lindsay recently led the Girls Fantasy Camp in Winnipeg alongside former National Team midfielder Kacey Burke to raise funds for U.S. Soccer’s upcoming development initiatives. In addition to her own camps (running this month in Michigan) she is working on Sweat Cosmetics with Chicago Red Stars defender Taryn Hemmings (co-founder and Chief Operating Officer), former University of Denver player Emily Hines (co-founder and Chief Financial Officer), ex-USWNT midfielder Leslie Osborne (Chief Marketing Officer), former Boston Breakers and FC Kansas City player Courtney Jones (Chief Executive Officer) and Real Housewives of Orange County cast member Meghan King Edmonds (Brand Ambassador / Director of Sales). The company aims to narrow the gap between beauty and fitness, also providing protection from the sun through their cosmetic products designed specifically for women who lead an active lifestyle. As Leslie Osborne did back in May 2012, Taryn Hemmings featured in her own music/soccer interview on here last September and the one-time Breakers player reveals the backstory to Sweat and what Lindsay gives to the venture. “My University of Denver teammate (Emily Hines) and I started talking about the idea that would become Sweat when we were still in school. We knew girls were wearing makeup while they played and really wanted to create the right kind of makeup for them to wear that would be good for their skin as well as protect them from the sun. “After I turned pro I met Leslie, Courtney and Lindsay, all in Boston. In the beginning, Lindsay started out volunteering to do whatever she could to help because she loved the idea of the product so much. “Eventually we realised how much she brought to the company and officially brought her on board. She’s been a huge proponent all along of our sunscreen factor and having worked with the Skin Cancer Foundation she brought a lot of knowledge and legitimacy to what we were doing. Lindsay’s former teammate Taryn Hemmings, co-founder of Sweat Cosmetics. 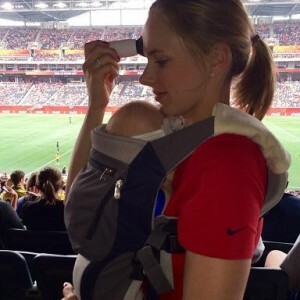 “Lindsay also brings something very special to the founders – besides her two gold medals – she’s a mom! With so many active moms out there Lindsay gives us the ability to really understand their needs firsthand, and as we’re finding out, the needs of their kids. A communications major back in her UNC days, Lindsay describes why there is even more personal significance behind her role with the company. “I am very fortunate to be part of such an amazing team. I am the Public Relations Director and I have always been very passionate about sun protection as I have had family members diagnosed with skin cancer and have seen their battle to overcome it. “Sweat Cosmetics promotes living an active lifestyle while protecting your skin and feeling beautiful at the same time. For me, it is an ideal product that fits my on-the-go lifestyle. A Portage Soccer Club Wall of Famer along with her husband, Lindsay has always talked about how fundamental her support system has been through her path in soccer and life. She was named the ESPN RISE Player of the Decade for the 2000s and many may not be aware of a specific impact she made for the better back in high school. In her junior and senior years, she played for the Youth National Team, subsequently being made to serve a three-game suspension due to a state association rule for Michigan players prohibiting them from out-of-school participation. Lindsay petitioned this and had the rule successfully changed, meaning high school players could now freely have this opportunity. She lived moments that so many dream about, undoubtedly inspiring others in the process, but turning the clock all the way back to when the World Cup, Olympics and getting to play soccer as a job were way off in the distance, what would she say if she had a moment to talk to herself as a young girl? The first time Lindsay ever appeared for the National Team at senior level was in January 2003 against Japan, and 124 caps on from that first one, they were the opposition again as she took the field to line up for the last time as The Star-Spangled Banner rang out. Her career brought her widespread attention in the game, undoubted hurt to overcome, lasting friendships and astronomical high points that can never be taken away from her. When you dedicate so many of your years to the sport in order to reach an optimum level, in whatever capacity it may be, the pure enjoyment that got you started can be forgotten on occasions. One scenario that can bring the fun element flooding back is a small-sided game. For anyone reading the site for the first time, this is the regular closing question and players from around the world have put together their fantasy line-up. If Lindsay was to step out into the action again and she had to pick four of her career teammates on her team, here are the ones who’d at least start the game, with an attacking mentality taking precedence of course! “I would pick Ashlyn Harris (goalkeeper), Leslie Osborne (midfielder), Heather O’Reilly (midfielder), Lauren Holiday (midfielder). Ashlyn – she’s quick and I know how hard it is to score on her. “HAO (Heather O’Reilly) is so hard to play against; fast, agile and can do anything she sets her mind to. Leslie – she is such a great leader and someone I’ve always wanted on my team.